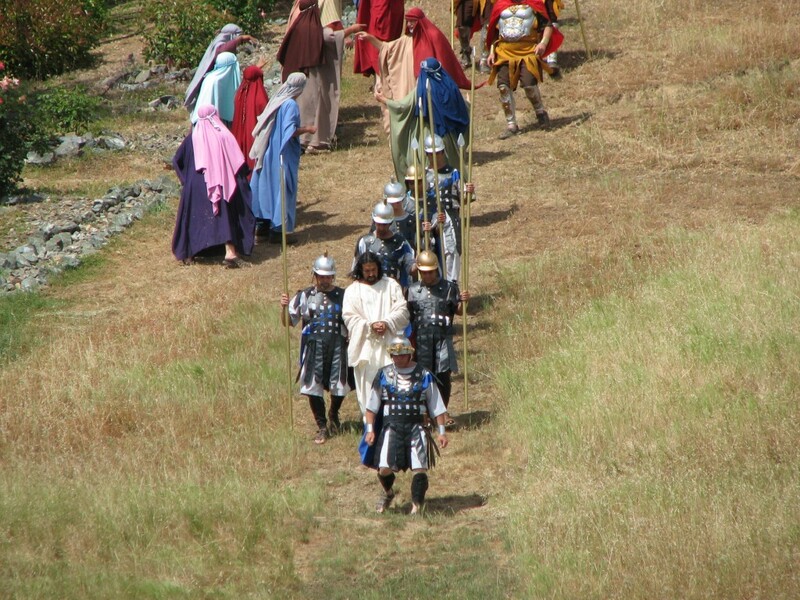 The Lake County Outdoor Passion Play is now readying for its 39th consecutive presentation on Saturday, May 18th, and Sunday, May 19th, 2019. The performances over the past 38 years have not only been an awesome religious experience for the cast and crew, but also for the thousands of people from far and near, who have witnessed this unique drama portraying and reliving the last days of Jesus’ life on this earth. Inspired and deeply moved by the power of this annual presentation to touch the hearts and souls of so many, the Passion Play Board of Directors is determined to continue promoting and developing the Lake County Passion Play. The Passion Play grounds consist of 85 acres on the shores of Clear Lake. Approximately 20 acres of the grounds are used for the actual presentation and for the audience. The remaining 65 acres are used for parking and for the Passion Play animals — sheep, llamas, and horses. On the 20 acres, there is a large ‘Garden of Gethsemane,’ plus the ‘House of Caiphas,’ the ‘Last Supper’ stage, ‘Pilate’s Judgment Hall’ and ‘Herod’s Palace.’ The ‘Via Dolorosa’ is a 615 foot climb to the crucifixion scene. Two of the stages — the ‘Last Supper’ and ‘House of Caiphas’ — had to be completely rebuilt in 2007 at a cost of $6,000. The labor involved in the construction was donated by a local contractor and some volunteers. These stages are magnificent and should be there for many years to come. Another pressing issue was the installation of new entrance gates to the Passion Play grounds. The gates were installed prior to the 2007 performances. The gates are built of steel, anchored on 6-inch steel pipes, immersed in 5 feet of concrete, and are encased above ground in 3-foot by 3-foot solid stone pillars. Two 20-foot solid stone walls extend from the pillars to the roadside, connected by two smaller stone pillars. The gates measure approximately 24 feet in width and weigh approximately 1,000 pounds. They have been powder coated in an off-white color. The construction included the addition of large blue metal letters which read “Lake County Passion Play.” The gates cost $10,000 to build and install. They are dedicated to the memory of a woman deeply committed to the Passion Play from its inception: Helen Burzynski.